But this weekend I was reminded that classic dishes became classics for a reason. After a stroll through Prospect Park (air cast be damned), I swung through the Grand Army Plaza Greenmarket where, despite the CSA bounty overflowing my refrigerator, I couldn’t resist picking up Italian eggplant, basil, and Bread Alone‘s insanely delicious whole wheat sourdough. On my stroll home, I devised a plan to toast the bread, slather it in ricotta cheese, and top it with basil, fresh peaches, black pepper, and perhaps a drizzle of honey. While I have no doubt that this dish would be delicious, the thick mold on top of my ricotta forced me to make other plans. Bring half a tablespoon of olive oil up to medium heat in a cast iron skillet. Add the garlic and cook stirring constantly until just tender but not yet browned. Remove garlic to cutting board, lower heat a bit, and add your bread slices. Flip your bread and toast the other side while your tomatoes macerate a bit. Assemble and enjoy. The simplicity of this classic dish is what makes it so perfect. Tragically, I ate my last tomato when I prepared this on Saturday. Here’s hoping tomorrow’s CSA share brings another batch! 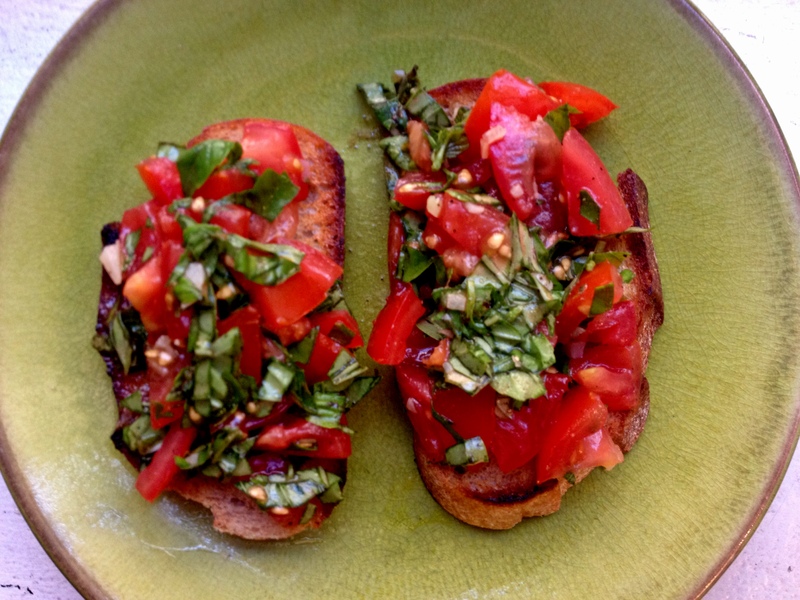 This entry was posted in appetizers & snacks, vegan, vegetarian and tagged basil, bread, bruschetta, tomatoes by Jasmine Nielsen. Bookmark the permalink.